Bonjour and welcome to the Cafe de Paris! 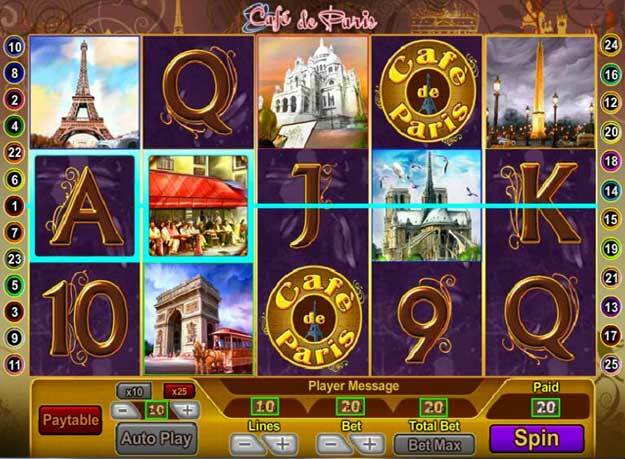 Enjoy a Parisian coffee break and enjoy this bistro-themed slot game. Sit back, relax, enjoy a croissant and get ready to win! Take a trip to romantic Paris and enjoy the cutesy Cafe de Paris slots. This elegant slot machine has plenty of fun bonus games and you can bet up to £10 per line so there really is big cash to be won. There are 25 pay lines to place your bets on and there are special symbols to look out for too. The slot features a wild and a scatter and three scatters will trigger the big money free spins round. Enjoy a fabulous theme and the chance to win big on Cafe de Paris slots.